Goodness! I get flack from my colleagues because I condone pollarding. It is such a no-no among modern arborists. However, I know it can be done ‘properly’, and I would even do it in my home garden if I wanted to. I pollard a blue gum (which I would NOT recommend to others) because I want the aromatic juvenile foliage, and also lack space for a full sized tree. (Although, I would like to get some adult foliage and bloom too.) If I had ‘Crimson King’ Norway maple, I might pollard it for the rich dark foliage! I know those sycamores or plane trees in your picture look goofy, but I think that they look sculptural and properly pollarded. I saw you had written an article about this sort of tree cutting, I did not know the name for it. It is done quite often here. I am not sure why, perhaps for the decorational effect or perhaps it makes more room. Thanks for the comments, very interesting. For those trees, it is probably done because their only problem is that they get too big if not pruned severely. Pollarding takes care of that, and keeps the foliage vigorous too. That is probably why it is done. In Winter they look quite strange, but in summer not so much. It is funny that English arborists are not so critical of the technique. In the English style, one or sometimes two short stubs are left on each knuckle to direct the growth into really gnarly elongated knuckles. In the American style, we cut everything off back to the same humongous knuckle. The English style is more sustainable. The knuckles of the American style eventually get too distended and eventually decay from within. Even though it is less sustainable, it still lasts half a century or so, or longer. The funny thing is that, although it is technically ‘bad’ for trees, properly pollarded trees can survive much longer than they would naturally. Beech trees in England have been pollarded for centuries. I have not seen it so much in England, but in Switzerland it seems to be common practice. It is all very technical for me. 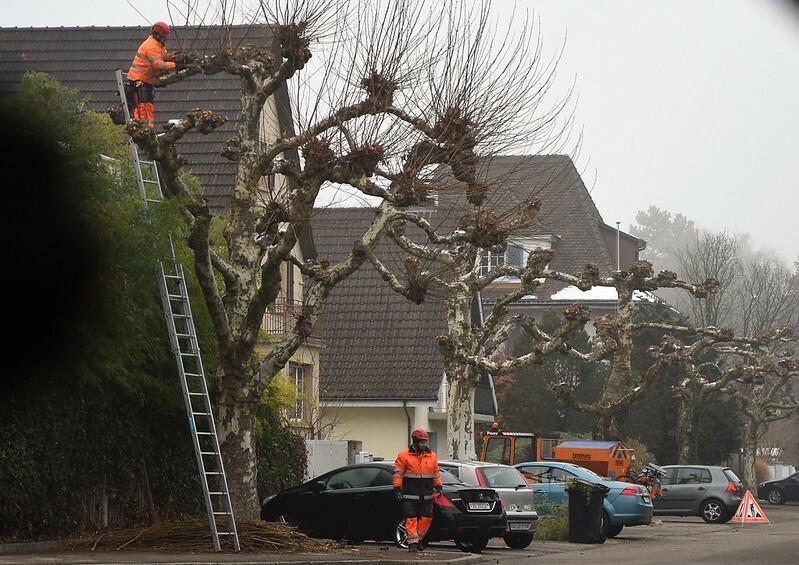 I saw that strategy for trimming a tree at the Lake of Constance — I’d never seen it before. Thank you for putting a name on it! I guess it makes for more shade in a particular place and diminishes the risk of big branches falling? Yes Tony Tomeo has some very useful knowledge about trees and how to look after them. Well, the main problem is that it sometimes gets done ‘once’ and then not again, as if it will fix something permanently. Once done, it must be repeated annually EVERY winter. Otherwise, limbs peel away from the knuckles as they get heavy. So, yes; it limits weight and wind resistance and keeps limbs from breaking for one year. But, no; it is not good for the tree, and is actually quite bad for it. It is an old technique done for a variety of reasons. For willows, it was done to provide stems for weaving baskets. For mulberry, it provides lush foliage for silkworm. For eucalyptus and other plants grown for cut foliage, it produces an abundance of juvenile growth without any adult growth. (For example, silver dollar gum makes those round leaves instead of lanceolate adult leaves.) For ornamental olives, it prevents messy fruit. Etc. wow, how much knowledge in this commenting. Over here they do the same thing to those trees. I only wanted to say that your story is so funny! It made me laugh out load. They just chop the centers out of all our trees that are anywhere near wires. It makes them both ugly and unhealthy.